Maine Education Commissioner Stephen Bowen and Gov. Paul LePage in 2012. AUGUSTA, Maine — The Department of Education, one of state government’s two largest departments in terms of consumption of taxpayer dollars, has been without a permanent commissioner for six months, raising the question of how long it will be before that slot is filled. Gov. Paul LePage appointed Tom Desjardin as acting commissioner in December but so far has not nominated Desjardin or anyone else to lead the department on a permanent basis. Jim Rier, who was commissioner until he went on medical leave last year, retired officially on April 17, starting a six-month clock for LePage to choose a permanent replacement. Desjardin served as an adviser to LePage before taking the Department of Education helm. So what led to this situation? January 2011: LePage took office. February 2011: LePage nominated Stephen Bowen, formerly a policy analyst for the Maine Heritage Policy Center, to be the department’s commissioner and take the place of Angela Faherty, the last education commissioner appointed by Democratic Gov. John Baldacci. Bowen’s nomination was later confirmed by the Senate and he became the public face for some of LePage’s most controversial education reforms, including the passage of a law that allows charter schools in Maine and a divisive A-through-F public school grading system. August 2013: Bowen resigns from the position to take a job with the national Council of Chief State School Officers. October 2013: LePage picks Department of Education finance veteran Rier to be the department’s acting commissioner. Rier proved to be a more behind-the-scenes commissioner than Bowen but was widely recognized as the state’s foremost expert on school finance. He was a regular at legislative committee hearings. January 2014: LePage nominates Rier to become permanent education commissioner. Rier is later confirmed by the Senate without opposition. November 2014: Rier goes on medical leave. 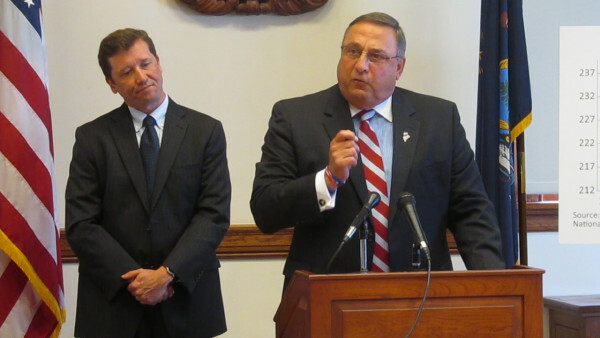 December 2014: LePage announces that Rier will not return and nominates Desjardin as acting commissioner. The next step for LePage would be to appoint a permanent commissioner, who would be interviewed by the State Board of Education and the Legislature’s Education Committee before a confirmation vote by the Senate. — LePage tapped former lawmaker Richard Rosen of Bucksport to be acting finance commissioner in May 2014 following the resignation of Sawin Millett. It was nearly seven months before LePage tapped Rosen to be the permanent commissioner in January 2015. — On at least one occasion, LePage defied what the law says about appointments. For nearly a year, he refused to make appointments to the Board of Corrections, despite a county jail fix law enacted in 2014 that gave LePage the authority to appoint a majority of the board members. But LePage made no appointments, which caused the Board of Corrections to be unable to form a quorum and take any legally binding votes. The board and its employees disbanded earlier this year, leaving the Legislature to come up with another solution. How long does LePage have to appoint a commissioner? According to Alex Willette, spokesman for the Department of Administrative Financial Services, Rier retired officially on April 17. LePage has six months from that date to appoint a permanent replacement, according to Willette. Through his spokesperson, Desjardin declined a request for an interview with the BDN. He has said in public more than once that his priority as acting commissioner is to usher new initiatives hatched under Rier and Bowen, such as a proficiency based diploma for Maine students and a teacher evaluation law, to fruition. What’s this mean for education in Maine? Maine School Management Association Executive Director Connie Brown said that Desjardin has been responsive and effective since taking over for Rier. He has attended numerous MSMA meetings and functions and communicates with the organization regularly. “We don’t always agree with his positions, but that was true of Commissioner Bowen and periodically of Commissioner [Susan] Gendron before him,” Brown said. Lois Kilby-Chesley, president of the Maine Education Association, said she isn’t worried about the situation. “MEA isn’t concerned by the timing of finding a permanent commissioner before June, because regardless of who is in the commissioner’s office for this six-month interim period, the work of public school educators goes on every day, and that work is providing learning opportunities for Maine’s students,” she said in a written statement for the BDN.